Postcard AU-407109 from Australia featuring Maitland-born Les Darcy (1895 - 1917), one of the best Australian boxers of all time, in boxing pose on a boxing troupe canvas painting circa 1950. Les Darcy was inducted into the International Boxing Hall of Fame in 1993, the World Boxing Hall of Fame in 1998, and the Australian National Boxing Hall of Fame in 2003. 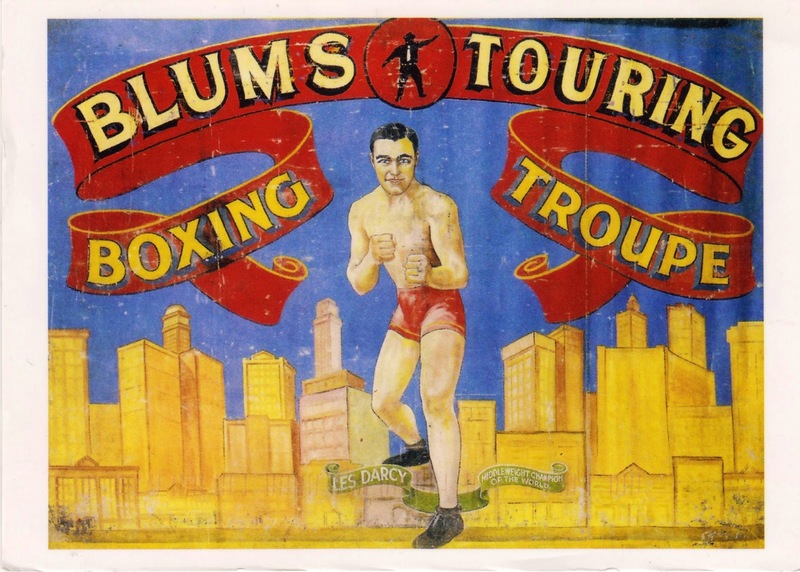 Blum’s Boxing Troupe toured Western Australian mining towns in the 1950s. This canvas decorated one of the tent walls alongside canvases featuring other famous boxers such as Dave Sands, Micky Miller and Vic Patrick.